﻿Looking back at 100 years of waterfowl hunting in Texas. ﻿The birds fell in heaps — ducks and geese, cranes and swans, shorebirds of all sizes. They were shot both night and day by any means imaginable and unimaginable — targeted by sportsmen aboard trains, in boats and from behind livestock. Yes, livestock. A century ago, the Texas coastal landscape looked a lot different, and so did waterfowl hunting. Both were unregulated, untamed and unreachable, unless you had the means and the desire. Back before the Intracoastal Waterway carved an industrial swath along the coast and before South Padre Island became an international vacation hot spot, duck hunting was the trend for recreation and commerce on the Texas coast. Ducks helped shape the coast. 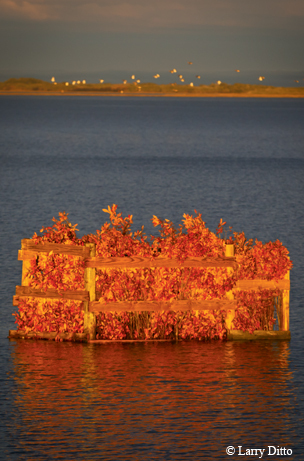 ﻿A waterfowl blind in St. Charles Bay near Rockport. If Texas has a duck hunting legacy, it is arguably one steeped in big business. Ducks have always carried value of one kind or another, whether for sustenance, trade or pleasure. Early settlers relied on the annual winter migrants for food, feathers for pillows and rendered lard for cooking. Then came the market men who saw waterfowl as a pure commodity to be harvested for profit. In the early 1900s, market hunting in Texas was outlawed, and the ducks were left to sportsmen and businessmen, who saw a different value in a duck. Exclusive private hunting clubs began springing up along the Texas coast as early as the 1870s and served as an oasis for the well-heeled sportsman. Today, a typical waterfowl hunt might consist of a half-day slog in and out of the marsh, but it wasn’t uncommon for a waterfowler a century ago to spend a month or longer on a waterfowl hunting getaway. Travel to duck country took days from Dallas or San Antonio before the railroads and automobiles. Ardent sportsmen from Chicago and points east traveled by steamer or schooner for weeks to reach the birds and were at the mercy of the weather. Much of the early development and infrastructure along the coast was born out of duck hunting. Legend has it that the city of Port Arthur got its start in a duck hunt. In 1899, barbed-wire magnate John Warne Gates killed 900 ducks in the area in one morning and was so impressed with the hunting that he decided to stay. He built a magnificent two-story colonial mansion that he called his hunting lodge and traveled there each fall from Chicago along the Mississippi River aboard his 100-foot yacht. Gates then constructed a manmade impoundment below Sabine Lake and built more infrastructure, including a three-story lodge and a spur road off the Kansas City Southern rail line that dropped his guests off at the door. Granted, that early foundation for Port Arthur was soon overshadowed by the discovery of oil at the Spindletop oil field, but it was an example of how duck hunting on the coast sparked development by prominent industrialists of the era. Proprietors of these exclusive hunting resorts carved out luxurious accommodations in an otherwise hostile environment to ensure the comfort of their guests. Private gamekeepers, whose job was to keep local hunters off prime shooting areas, were also called fence riders or game wardens and were often confused in the early 1900s with the real lawmen by the same name. The elite sportsmen of the day rode in fancy private Pullman cars accessorized with dog kennels, gun racks, dining room and kitchen, as well as staff to cater to their needs. The trains were even used as a part of the hunt. ﻿Waterfowl hunting helped shape the Texas coast. 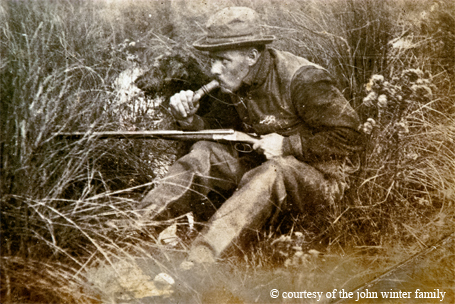 After market hunting was outlawed in the early 1900s, the ducks were left to sportsmen such as this one in the 1920s. On some lines, the conductor would stop along the route to allow hunters to shoot prairie-chickens, quail and deer. On the Gulf and Interstate Railway between Galveston and Beaumont, hunters could get off and sneak up on mallards while the other passengers cheered and jeered. In South Texas, ducks along the tracks of the Rio Grande Railway bridges between Port Isabel and Brownsville were shot from windows of the slow-moving train; the conductor would then stop to permit the hunters to retrieve their game. The railroad played a huge role in getting hunters to the marsh. It wasn’t uncommon for hunters to carry camping gear, and the train conductors would stop anywhere along the line to allow them to get off and go hunt for a few days. When ready to go home, the hunters would follow the rail tracks and flag down a train for the ride back. Trains weren’t the only means hunters used to get close to the birds. Some enterprising waterfowlers inland on the prairies used trained livestock as moving “blinds” to creep within shooting range. Steers and oxen were taught to move in slow circles as if grazing, all the while getting closer to unsuspecting feeding waterfowl. The introduction of the gas-operated engine became a game-changer for moving waterfowlers to and from the marsh. Automobiles and outboard motors enabled hunters to reach the ducks from all sides. Rather than taking weeks, waterfowlers could take day hunts. “Waterfowlers were among the first to embrace the gasoline engine and what it could do to help get them to the birds,” Sawyer says. Looking at vintage photos of marsh buggies and early airboats in Sawyer’s book is reminiscent of the 1960s movie classic, Those Magnificent Men in Their Flying Machines. Sawyer’s book is available through Texas A&M University Press (www.tamupress.com). Skill Builder: Which Duck Is Which?